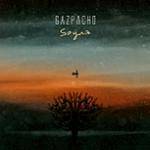 Soyuz is the 2018 studio release from Norwegian Art Rockers Gazpacho. More information: The songs on Soyuz are a series of short interconnected stories about people frozen in time, with the tracks Soyuz One and Soyuz Out focusing on the first Russian Space capsule and its doomed captain, Komarov. Known for its distinctive sound that balances tense and beautiful arrangements, sinister and soulful melodic lines, Soyuz furthers Gazpacho’s growing reputation. Recorded at Krypton Planet and St. Croix Fredrikstad in Norway, the artwork - designed by painter Antonio Seijas - is inspired by Russian Cold War colours and fonts from the Soyuz One flight era. CD in mediabook with 24-page booklet featuring additional artwork and lyrics.